Bus riders may find it easier to get to their destinations with the help of electronic messaging signs that the Los Angeles County Metropolitan Transportation Authority is installing at bus shelters along major transit corridors. The signs are part of Metro’s Nextrip E-sign Project, which includes the installation of 300 new electronic signs throughout the city. Approximately two-thirds of the signs have already been installed, with the program’s completion anticipated in early 2019. The signs will display arrival times for all lines that use each stop. In the local area, that also includes bus lines not operated by Metro such as the city of Los Angeles’ DASH buses and the city of Santa Monica’s Big Blue Bus service. In the local area, the signs have been installed or will be soon be placed at bus stops along Wilshire Boulevard at La Brea and Western avenues, as well as Crenshaw Boulevard. 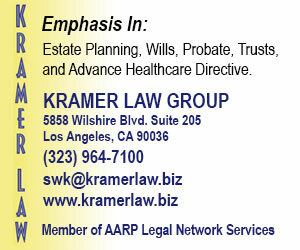 Along Third Street, the sites are Ogden Drive, and La Brea and Western avenues. The signs will also be in shelters along Beverly Boulevard at Fairfax Avenue and La Cienega Boulevard, as well as Melrose Avenue at Fairfax, La Brea and Western avenues. In Hollywood, the signs will be in bus shelters at Santa Monica Boulevard and Highland and Western avenues, and on Sunset Boulevard at La Brea, Highland and Western avenues, as well as Vine Street. A sign has also been installed at Hollywood Boulevard and Western Avenue. Near Beverly Hills, they will be in shelters at Olympic and Robertson boulevards, and Olympic Boulevard and Century Park East. The signs will also be used to notify riders about changes to services. Martinez used the example of street closures for special events or construction, during which the signs will provide messages about alternate routes. 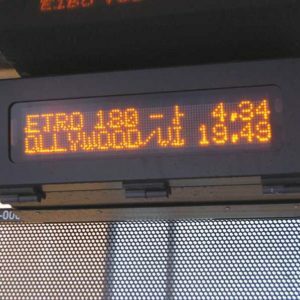 Metro contracted with the company Syncromatics to install and operate the message signs. The program was funded for three years through a $4 million Metro allocation. Most of the signs are wired to existing electrical power sources, but approximately 20 percent are solar powered. “To the extent we can … we try to take advantage of locations that allow solar options,” Martinez added. The signs are already proving to be a hit with some bus riders. Scott Epstein, a Fairfax District resident who is chair of the Mid City West Community Council, said he first noticed one of the signs Tuesday at a bus shelter at Fairfax and Melrose avenues. Epstein said he would like to see the signs at stops throughout the city. He takes the bus daily from the Fairfax District to his job at UCLA and back. Anything to make the commute easier would be beneficial, he added.